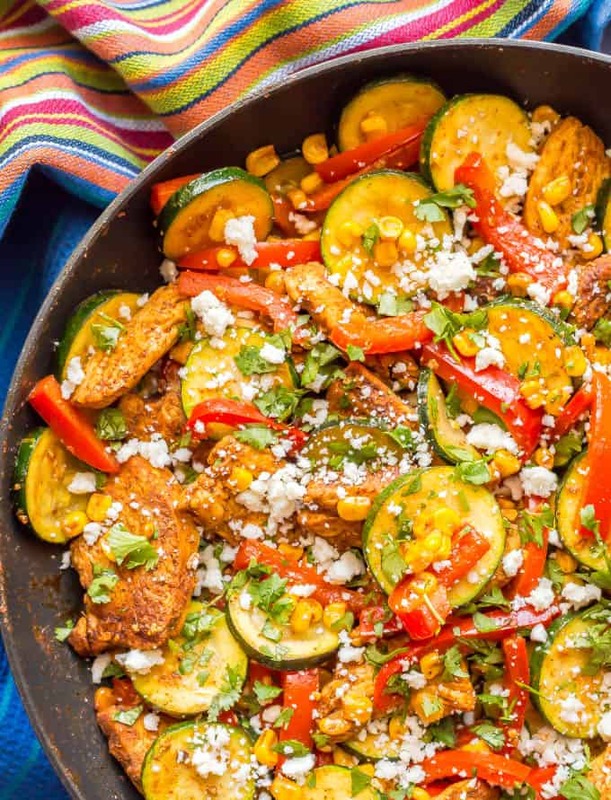 Chicken and zucchini skillet with corn is a one-pot wonder full of southwestern flavors, colorful veggies and juicy chicken. 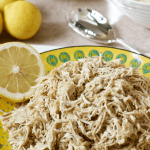 It’s a gluten-free and low-carb recipe that’s perfect for meal prepping. It’s the middle of the week and man, it just feels like the middle of the week. Work has been busy, kids have been busy and while I’ve been doing a good job of getting to bed at a decent hour, I’m still feeling a little slow. She shared a copy of her cookbook with me and I’ve been marking off so many pages – there are TONS of great recipes here that I’m excited to try! It’s super tasty and perfect for a weeknight family dinner that will be delicious reheated for lunch the next day. The chicken in this dish is so well seasoned and juicy. Plus it’s a one-pot recipe that’s popping with color, which you know I love. And while we initially ate it for dinner, I can personally attest that this makes a fabulous lunch. The leftovers reheat really well so it can definitely be a good recipe for your meal prepping. I used my homemade taco seasoning but Mary makes hers with a homemade Mexican seasoning mix. You could substitute a store-bought seasoning mix as well. You could add some chopped onions or throw in a few handfuls of spinach to this as well. 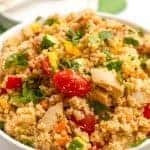 As I mentioned, it’s great on its own (and is low-carb) but could be paired with rice or cauliflower rice. Or you could serve it over quinoa or couscous. I took her suggestion and used Cojita cheese but I think shredded cheddar or Monterey Jack would work here too. 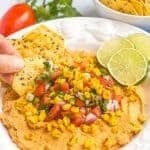 You can also top this with chopped fresh tomatoes or some salsa, or add some sliced avocado to serve it. The leftovers reheat well. (This is from the make-ahead lunches section of her cookbook.) I rewarmed mine over the stove but a microwave works too. 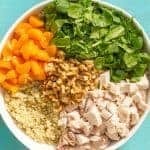 Next on my list from her gorgeous cookbook is the spinach couscous salad with chicken and cranberries, warm Mediterranean pasta, cheesy green chile chicken, taco rice and the cheesy chicken enchilada pasta. Oh and also the southwest chicken melt sandwiches and crispy green chile pork skillet too. So much YUM! 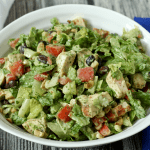 From the breakfast section, I can’t wait to try the chipotle egg salad breakfast sandwiches, tortilla eggs, cheesy egg French bread breakfast pizza, breakfast tostada stacks and the slow cooker nutty coconut granola. 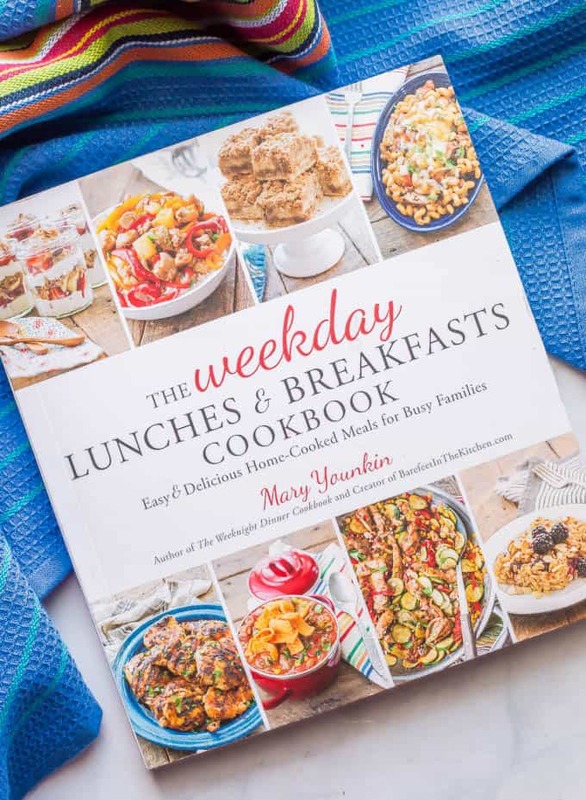 I hope you give this easy skillet chicken recipe a try and I hope you check out Mary’s beautiful cookbook. I know you’ll find some new favorites. You can also follow her and find delicious recipes at her blog Barefeet in the Kitchen. P.S. 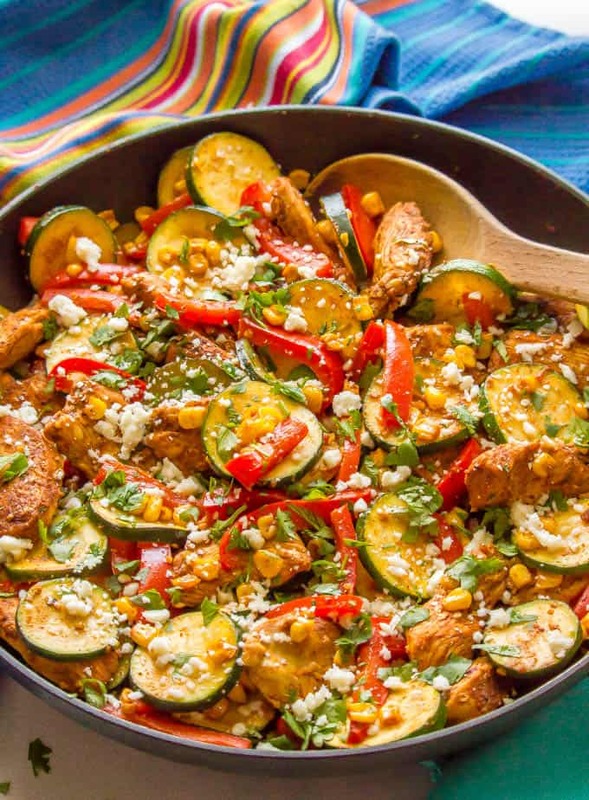 If you love this recipe, I think you’ll also enjoy my southwestern chicken skillet dinner. 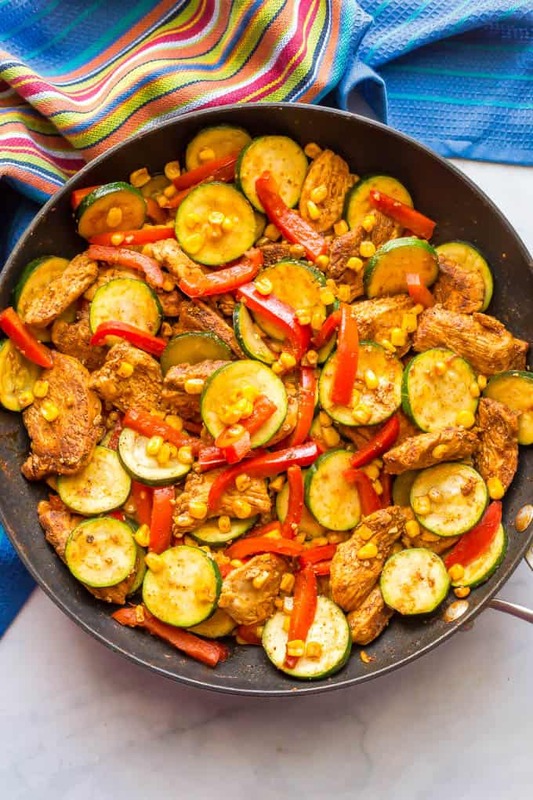 Chicken skillet with zucchini and corn is a one-pot wonder full of southwestern flavors, colorful veggies and juicy chicken. Place the chicken in a medium-sized bowl. Drizzle with 1 teaspoon of oil. Sprinkle with the taco seasoning and stir well to coat the chicken pieces. Heat a large skillet over medium-high heat. Add 1 teaspoon of oil to the skillet. Add the chicken and toss to coat. Cook for 4-5 minutes, constantly stirring until the chicken has browned and is cooked through. Transfer the cooked chicken to a plate and tent with foil to keep warm. Add the squash, pepper, corn and garlic to the same skillet. Sprinkle with the taco seasoning. Cook over medium-high heat, stirring frequently, until the squash and pepper begin to wilt and everything is warm, about 4-5 minutes. Add the chicken back the skillet, along with any accumulated juices. Add the lime juice and scrape any browned bits off the bottom of the skillet. Stir to mix everything together well then remove from the heat. 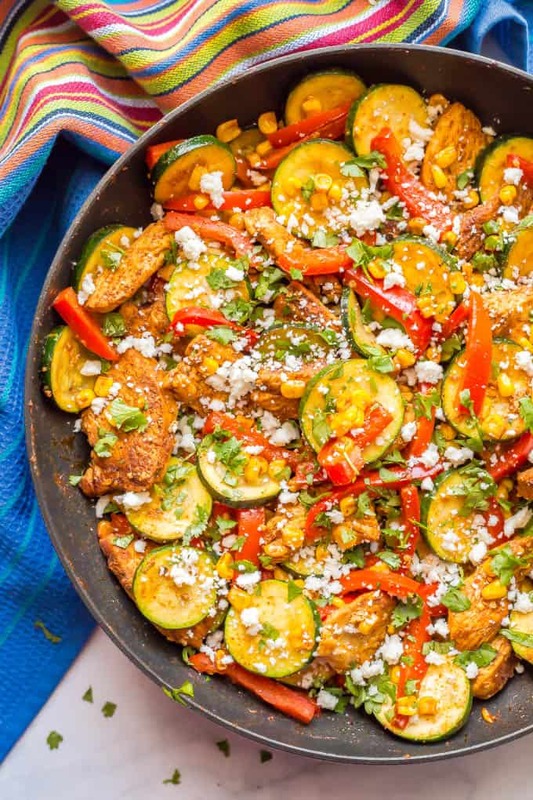 Sprinkle skillet with cilantro and Cotija cheese and serve. 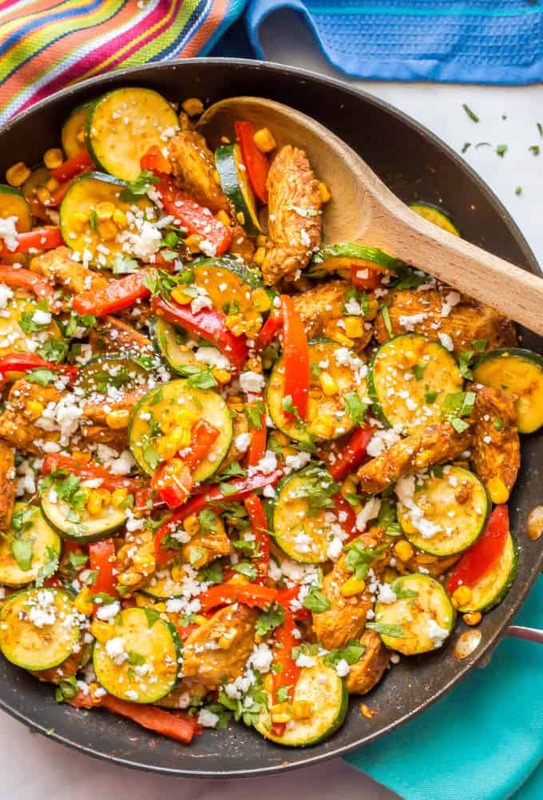 This skillet chicken is great on its own but could be served over rice or cauliflower rice. You can substitute shredded cheddar or Monterey Jack cheese for the Cotija if you prefer. I use a homemade taco seasoning, but you can substitute store-bought taco seasoning or use a Mexican-flavored seasoning blend. Want a little kick? Stir in some red pepper flakes or serve this with some hot sauce. The leftovers can be stored in an airtight container in the fridge for up to 3 days. Reheat on the stove or in the microwave. Based on a recipe in the The Weekday Lunches and Breakfasts Cookbook by Mary Younkin. I’m so happy to hear you enjoyed it Christopher! Thanks so much for sharing! 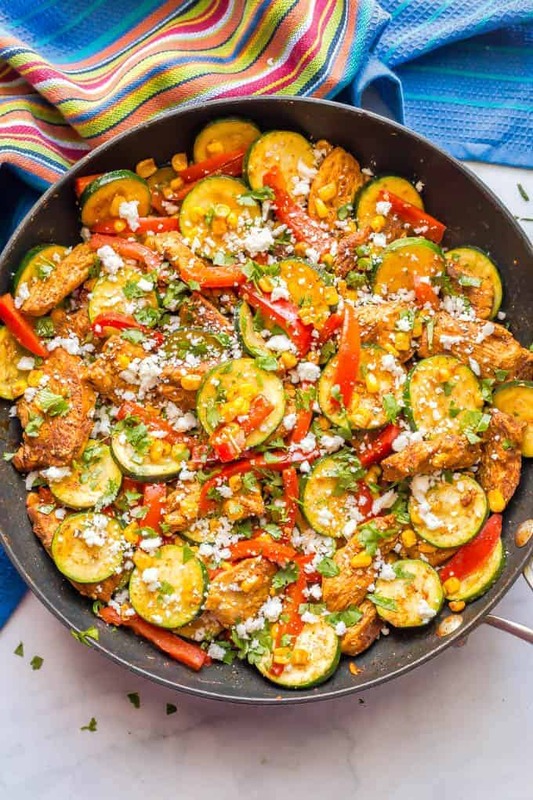 I’m thrilled that you are enjoying the cookbook and that you like this chicken skillet as much as we do! Thanks so much! It’s such a beautiful cookbook Mary! 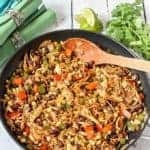 I’m planning to make the Lumpia Skillet this week!